This page describes how Dental Implants can replace missing teeth. 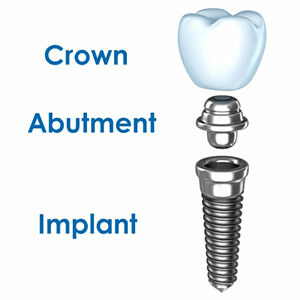 If you are missing a single tooth, a dental implant and a crown can often be used to replace it. A dental implant replaces both the lost natural tooth and its root. Dental implants are a permanent restoration and are a great way for those with missing teeth to improve their smile and restore proper chewing function. When properly placed and restored, dental implants can drastically improve the cosmetic appearance of your smile. Additionally a dental Implant looks and feels like your own natural tooth.